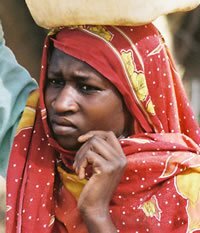 The Fur people live in the Darfur region of Sudan. They are also located in Egypt and Chad, but the word Darfur means “the homeland of the Fur.” There are 1,164,000 Fur people in Sudan and a total of 1.2 million globally. They are primarily Sunni Muslim. Many men cannot hope to be married unless they have memorized several pages of the Quran, and they are promoted to authority depending on how well they know the Quran. In recent times, these people have been embroiled in bitter conflicts. Because of drought and desertification, war over resources has arisen between the Arab and indigenous people. In 2003, the Fur people banded together with two other indigenous groups to demand reparation for the oppression they suffered. In response, the government sent a guerilla force to attack the civilian population of these tribes. Hundreds of thousands of civilians were killed and over a million refugees have fled their homeland and sought refuge in Chad and other areas. Pray for peace in the Fur’s homeland. Also pray they would know the peace that comes from knowing Christ as their Savior.